The best white water rafting in Ubud Bali, experience the exciting adventure in Ayung River Ubud with a professional team and the best price offer! Ayung River is one of a beautiful place on a high riverbank, surrounding the view are covering ripple rice terrace and subtropical forest. Ayung river also has several small waterfalls, the rafting on Ayung River is safe and will be accompanied by a professional instructor who will guide the activity of your adventure and of course the team and staff are dedicated to serving domestic and foreign tourists professionally. The route of adventure approximately 12 kilometers and can be reached within 2 hours. 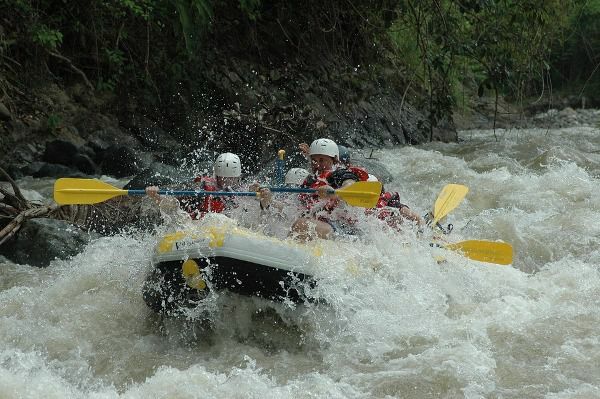 The rafting activities will take about 7 hours in the hotel from the time we pick you up and back to your hotel. We recommend wearing clothes that are comfortable to use for white water rafting activities (short pants, sandals with straps). We would like to suggest you wear short pants or swimsuit, a change in any clothes, sports shoes or strapped sandals and extra money for drink and souvenir. Please kindly fill your detail pick up the address or any local phone number for a smooth pick up arrangement. MINIMUM 2 PERSON ON DETAIL OF BOOKING NUMBER. Free pick up from Kuta, Legian, Seminyak, Canggu, Sanur, Jimbaran, Ubud, Denpasar, and Nusa Dua only. Insurance is not included for personal items brought to the river. (please store it safely in the locker provided).